I left Nefyn for the first time in late July 1957. I had completed my ‘O’ levels at Pwllheli Grammar School earlier in the month, and I was eager to leave school and start work. Since I was very interested in the sea, a seafaring career was my first choice, and I made an application to join the HMS Conway naval training school at Plas Newydd. The naval school was moved to Plas Newydd after the original HMS Conway training ship was wrecked in the Menai Straits in 1953, and destroyed by fire in 1956. The naval training establishment awarded a full scholarship every year to two local Welsh candidates, one from Caernarvonshire and one from Angelsey. A full scholarship was essential for my application to be successful. Unfortunately, the application came to a very abrupt end. I was completely deaf in my left ear, and I was immediately eliminated from consideration. 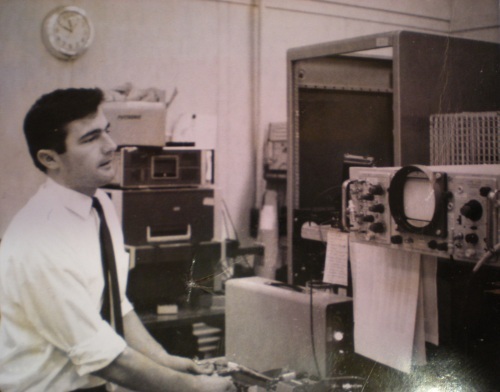 My second career choice was in radio and electronics, and following my failed naval endeavor, I applied for a position as a technician at the Royal Radar Establishment (RRE) in Great Malvern, Worcestershire. I was surprisingly asked to go to Great Malvern for an interview. So on my first trip out of Wales, at the ripe age of 16, I caught a train early on a Saturday morning in July 1957 from Pwllheli railway station to Great Malvern. For the trip, old Dai Fron, my grandmother’s neighbor in the Fron, kindly lent me a little brown leather suitcase that he had used when he went to France in the early 1920’s. My Uncle Bob, who worked for Great Western Railway, made all the train schedule arrangements for the trip. The train left Pwllheli around 8:00am and I had to change in Shrewsbury and Hereford. I got into Great Malvern around 4:00pm in the afternoon, and stayed in a hostel that was recommended by RRE. It turned out that the custodial head of that hostel lived in Nefyn at one time, and knew my father. 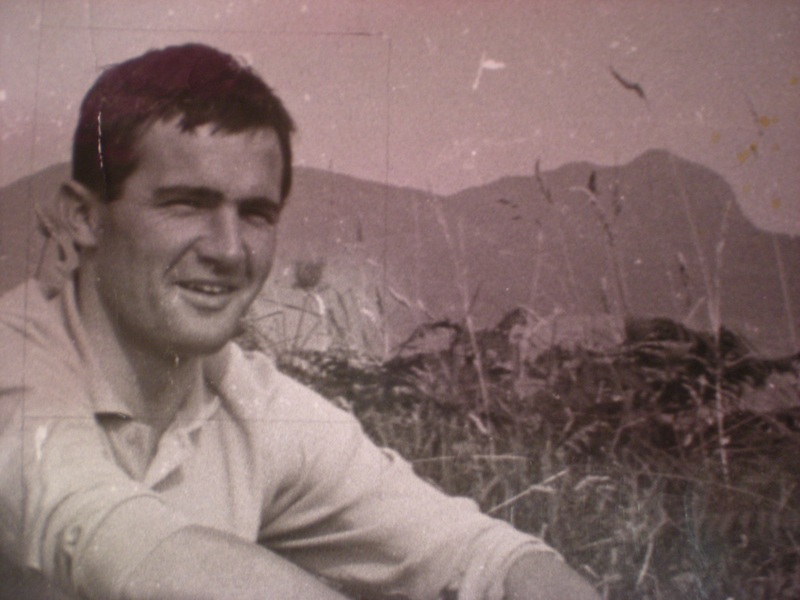 He had a son Glyn whom I also vaguely knew from Nefyn Primary school. I spent a very pleasant Sunday with the family before my interview on Monday morning. The family, by the way, eventually moved back to the Nefyn area, and ran the Cliffs Inn in Morfa Nefyn. The interview at RRE was not very pleasant. I was interviewed simultaneously by a group of six people, and I was very intimidated by a remark made by one person on that panel when I first sat down. He had that snobbish English accent, and although I do not remember now exactly what he said, I recall the remark being scathingly negative about my application. It threw me completely. My all-Welsh background at the time was a serious impediment to my English conversational skills, and negative remarks of that nature had significant impact. I remember not being very responsive thereafter keeping my answers very brief and to the barest minimum. I just could not wait to get out of there. I returned to Pwllheli on Monday evening in time to catch the last 10:00 o’clock Crosville bus back to Nefyn. The results of the ‘O’ levels were published in August, and I had done very well passing eight subjects out of nine. The one I failed was not surprisingly English language, and in order to matriculate, I had to retake that examination again in early August. The RRE interview results came out in late August with the anticipated news that I was not accepted. Little did I know at the time, that it was all for the greater good. With no other alternatives, I decided to stay on at Pwllheli Grammar to complete my ‘A’ levels. I must have been fairly intelligent since I completed my ‘A’ levels in Mathematics and Physics in July 1959 with no problems. Again, eager to work, I applied for entry into the Welsh College of Advanced Technology (WCAT) in Cardiff, South Wales. They offered what was termed a four-year ‘sandwich’ course with six months of every year spent in college and six months of every year spent working in industry. I started on the sandwich course in Cardiff in early September 1959. The college work was very intense, and in hindsight very well formulated. The course curriculum was designed by the head of the electrical engineering department, a Mr. C T Baldwin, who was related by marriage to Prime Minister Harold Wilson. Since those sandwich courses were relatively new, they were very sparsely attended, and the number of students in the classes was typically twelve to fifteen. The college course work exposed the students not only to all facets of engineering, but also to accounting, business practices, technical writing skills, oral presentations, debates, current affairs, politics etc. - all the attributes necessary to make the individual into a well-rounded engineer. The debates and presentations were very influential in improving my English vocabulary and oral skills. I remember one task in particular where we had to read articles in the Sunday Times and Guardian, and debate the following week the relative merits of Richard Nixon versus John Kennedy in the on-going US presidential campaigns. The oral courses also involved impromptu presentations where the lecturer indicated a topic and the student had two minutes to gather his or her thoughts and immediately present a five minutes lecture on that particular topic. The electrical, mechanical, chemical and mathematical engineering courses were excellent. My four-year industrial periods were served with Guest Keen & Nettlefolds, an iron and steel company in Tiger Bay, Cardiff; Line Equipment Ltd a high voltage design company in Bridgend, Glamorganshire; and two periods with the GPO Engineering Department in Dollis Hill, London. I thoroughly enjoyed those later periods with GPO Engineering, and I got very interested in their early semiconductor development work, which was starting to have a revolutionary impact on electronics. During the four years, I was only able to return to Nefyn at Christmas time and for a brief two-week holiday during the summer months. Instead of being a native with all that local expertise, I was rapidly becoming an outsider, no different to the English visitors that I used to hire rowing boats to years earlier. My divorce from Nefyn was slowly but surely underway. On the cliffs in Nefyn in the summer of 1960. I graduated from the WCAT in Cardiff with honours in 1963, and then applied for a position in a graduate MSc electronic course at Birmingham University. I completed that course in July 1964, and immediately opted not to accept the MSc, but to apply the work towards a PhD in Electronic Engineering, which I could complete with approximately two and a half more years of research work. A strange twist, but part of the work for my PhD involved working on solid-state microwave amplifiers. There were several electronic options for solid-state microwave amplifiers at the time, and the undisputed champion of one option, the Gunn Oscillator, was the Royal Radar Establishment. I made several trips from Birmingham to Great Malvern to interact with the experts at RRE. It was somewhat peculiar to walk through the same gates that I had walked through seven years earlier, now though under completely different circumstances – a reflection perhaps on the impact of education. Although I remembered the name, I never got to meet that individual who made me feel so uncomfortable during that earlier interview. I would have most certainly made him aware of it. The research PhD work at Birmingham proceeded extremely well with many innovative breakthroughs. During the work, I was in contact with several researchers in the United States, specifically at Westinghouse Corp in Pittsburgh and Bell Telephone Laboratories in New Jersey. Those researchers were very co-operative, providing complimentary experimental semiconductor devices that were simply not available in Britain at the time. I completed my PhD work under the guidance of Dr. G T Wright in Birmingham in late 1966 and submitted my thesis for review in January 1967. The reviewer was Professor F J Hyde from Bangor University who visited Birmingham to conduct the review in late February. It was painless and straightforward. Professor Hyde was very enthusiastic about the work, and everything was completed to his satisfaction. I remember receiving his congratulations, and asking if I was interested in a research position closer to home at Bangor University. It was a very tempting opportunity since the openings for young electronic engineers in industrial Britain at the time were very limited. But I was comfortably settled in Birmingham, and I decided to continue with my postgraduate work there. I officially received the PhD in July 1967. The ceremony was held at the University’s Great Hall, and the guest speaker at the ceremony was the ex-Prime Minister Anthony Eden. That was an extremely proud day for my parents who traveled down from Nefyn with my brothers for the occasion. 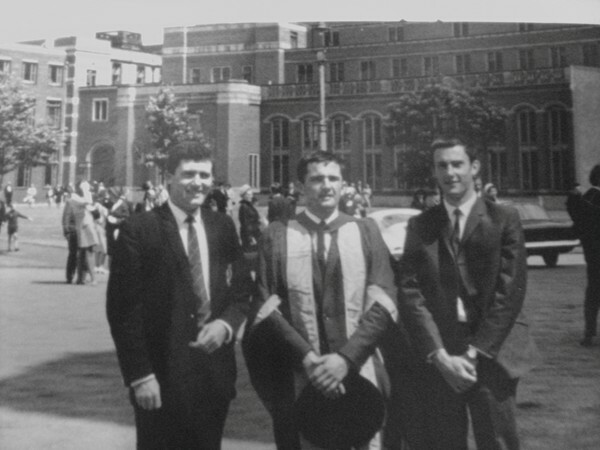 Michael, Brian and Terry Owen at Birmingham University, England in July 1967. The opportunities for engineers remained in the doldrums during the year, and several of my co-researchers at Birmingham were taking positions in Australia, New Zealand, Canada, South Africa and the United States. The technical ‘brain drain’ from the country was in full swing. The educational opportunities generated through grants and scholarships in Britain was spawning a large output of young physicists and engineers that far exceeded the number of openings available in both the public and private sector. The salaries offered were abysmal, and highly qualified people were leaving the country in droves for better opportunities elsewhere. In the United States, the demand for engineers was expanding rapidly, and many US companies were actively recruiting in Britain, offering very lucrative salaries. In December 1967, Terry Riley, a co-researcher at the University of Birmingham, got a position with Bell Telephone Laboratories in New Jersey. He wrote to me and suggested strongly that I apply. Bell Telephone Laboratories was regarded without exception as the premier electronic research and development organization in the world. Terry forwarded me an application form, which I promptly filled out and returned to the Bell Labs headquarters in Murray Hill, New Jersey. Two technical directors from Bell Labs came and interviewed me in Birmingham. Both were European born, Dr Alan Chynoweth originally from England and Dr Rudy Englebrecht originally from Switzerland. They invited me over to Bell Labs to give a presentation on my PhD research work. I was flat broke at the time with no money to pay for the airline ticket and other expenses. So I visited the Barclays Bank at Five Ways in Birmingham to canvas for a loan from the bank manager. I showed him my qualifications, together with all the paperwork I had received from Bell Labs. I indicated that it was a temporary loan, since Bell Labs would be refunding all my expenses. He very graciously obliged, so I was all set to go. The interview was scheduled for the beginning of January 1968. I caught an early morning train from New Street, Birmingham to London and flew out of Heathrow Airport on Saturday morning January 6, 1968. I had never flown before, and it was a very exciting experience heading for America. Bell Laboratories had booked me into the New York Hilton Hotel for that Saturday evening with instructions to take a taxi on Sunday from New York to a hotel in Summit, New Jersey. It was bitterly cold when I arrived in New York, and all I had in the form of an overcoat was a thin raincoat. I remember taking a walk down 52nd street with the bitterly cold wind swirling around those tall buildings. I promptly made a u-turn back to the hotel. I also remember going for dinner in the hotel in Summit, and ordering a steak. In typical American fashion, the steak covered the complete dinner plate while the potatoes and vegetables were on much smaller side dishes. And when the poor waitress asked me what dressing I wanted on my salad, I did not have a clue what she was talking about. I was only used to ‘salad cream’, and she had never heard of ‘salad cream’. The restaurant had Vinegar and Oil, French, Russian, and an infinite number of other salad dressings of various nationalities. I guess I picked one of them. I met Alan Chynoweth for breakfast at the hotel early the following morning, and then it was on to Bell Labs in Murray Hill where I gave a presentation to a large audience on my PhD work. As I found out later, after the presentation, all the supervisors and department heads who were interested in me joining their organizations then showed me around their laboratories and explained what they were researching or developing. I spent the whole day there. In the evening, Alan drove me to the Molly Pitcher Inn in Red Bank where over dinner another gentleman named Pete Hutchison took over as my host. The whole procedure was repeated on Tuesday at Bell Laboratories in Holmdel. On Tuesday evening, I was driven by Pete to the Coach and Paddock Inn near the New Jersey / Pennsylvania border, where over dinner another host named Clare Barnes took over and the whole procedure was repeated on Wednesday in Bell Labs, Allentown, Pennsylvania. And it was repeated yet again, on Thursday, with Al Barnowski as the host in Bell Labs, Reading, Pennsylvania. At 4:00pm on Thursday afternoon, Al drove me to the airport in Reading where I caught a small commuter flight to Kennedy Airport in New York Then it was on to a BOAC flight back to Heathrow Airport in London, arriving early Friday morning. The whole trip was just outstanding. My presentations were very well received at all the Bell Labs locations. There were endless compliments about the clarity and content of the presentation together with comments about the richness of my accent. The Americans just adore those Celtic accents. I was just taken aback by the whole experience, and my mind was completely made up. My first choice was a position at Bell Labs in Allentown, Pennsylvania where the research and development work being done was very similar to the work I had been doing in Birmingham. I received a letter at the end of January offering me a position at Allentown with an annual salary almost twice what I would receive as an engineer at a government establishment in Britain. Single, 26 years old, and eager to see the world, I had no second thoughts about the Bell Labs offer, and I graciously accepted the position. There were some obstacles still to overcome. I had no car, I couldn’t drive, and I was very much aware that America was an automobile-oriented society. I had earlier taken some driving lessons in Birmingham, but completely flunked the driving test when I nearly crashed into the back of a bus on Harbourne Park Road. I took comfort in the fact that cars were driven on the other side of the road in America, so I was going to have to pass the driving test over there anyway. I also had to make a quick visit to the United States Embassy in Grosvenor Square, London for an US resident visa. I terminated my postgraduate work in Birmingham at the end of January and returned to Nefyn for a few weeks. It was the appropriate thing to do, a brief holiday before emigrating. My grandmother in the Fron was aghast at the whole idea. The Vietnam War was in full swing, and the newspapers were awash with reports of riots in cities such as Newark and Los Angeles. I was also liable to be drafted into the US Army. Bell Labs had indicated, that because of my qualifications, being drafted into the US military was very unlikely. But they could not be totally certain. The few weeks I had in Nefyn were very relaxing. I spent most of my time there with three old friends Arthur Ensor, John Parry Hughes, and Trevor Rowlands. I left Nefyn for America with just a small suitcase on March 12 and entered the USA officially on March 13, 1968. The following morning, I started work at Bell Laboratories in Allentown, Pennsylvania. Bell Labs was the research and development arm of American Telephone & Telegraph Company (AT&T). AT&T was a regulated monopoly, similar somewhat to the GPO Telephone Department in Britain. It was responsible through its Bell Operating subsidiaries for running all the telephone systems in the United States, through its Western Electric subsidiary for the manufacture of new components for those systems, and through Bell Laboratories for research and development of new components and systems. Bell Laboratories was well funded by AT&T, and its employees were recruited from PhD candidates from all over the world. There were many Brits working within Bell Laboratories with a dozen or so working in the Allentown Labs. But I had the unique distinction of probably being the only Welsh-born employee, and most certainly of being the only Welsh-speaking employee, in the whole organization. The Allentown area very quickly became a home-away-from-home. The American people were extremely hospitable and friendly, and Bells Labs was an excellent organization to work for. The research and development work conducted at the Labs was always exciting, and the organization was continually pushing the outer limits of what was technically feasible in telecommunications. And in sharp contrast to many British and European organizations, compensation and promotion was based solely on the strength of the individual’s skills and contributions, and not on nationality. I had no regrets at all about the move to America to work for Bell Laboratories. It was the best move I ever made, but that’s another story. Gone forever though was the young kid who speared flatfish, poached salmon, netted herrings, snared rabbits, and caught lobsters in the rocks on Nefyn Point. My divorce from Nefyn was nearly complete. I would in the future not only be a visitor to Nefyn, but a foreign visitor with an American accent at that. Still, as my father used to say in Welsh when the challenges of life got a little tougher, “Ta waeth - fel’a mai” (So what - that’s how it is). And that indeed is how it was.